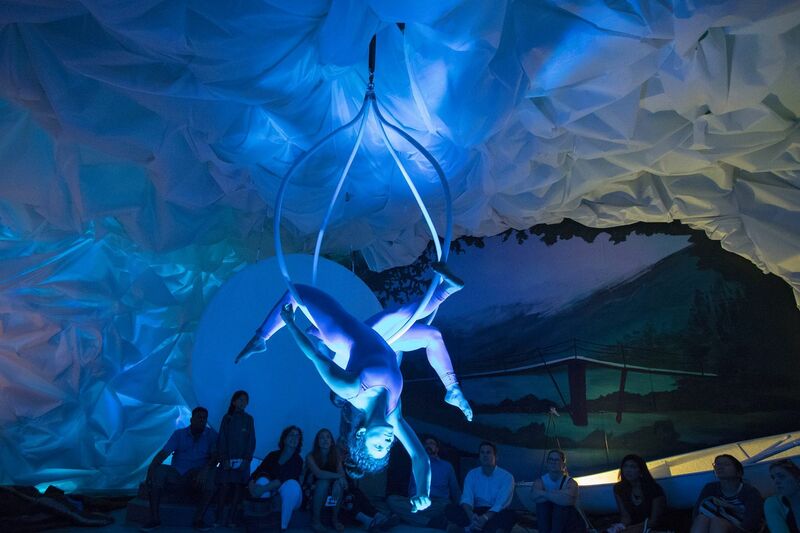 Figmago, an immersive art and performance piece created by mural artist Meg Saligman and choreographer Brian Sanders, opened this past Wednesday. Famous Philly mural artist Meg Saligman, who is right now designing an Eagles championship mural commissioned by the team, has also launched an audacious new side gig in partnership with the Philly dance troupe Brian Sanders' JUNK. Their new FIGMAGO entertainment attraction, which opened this week inside of Saligman's South Philly studio, aims to present a guided tour into the chaos of the creative process. It's an interactive walk-through experience involving art, dance, and music, with visual stimuli shooting out from every direction. Saligman says the idea is to let people explore their own creative nature "while also getting a peek into how an artist actually thinks." There are two versions of the show: FIGMAGO Alive, where live dancers and actors are part of the mix, and a less expensive alternative where they're not. A roughly hour-long FIGMAGO Alive preview performance that the Inquirer and Daily News visited Tuesday night started with a studio tour in a room filled with a messy array of paint cans, fragments of Saligman's past projects, to-do lists, shards of glass, and other tools from the life of a professional artist. On the walls were images from Saligman's murals, including a colorful piece painted on water coolers in Tanzania. Here in the entrance room, guests got a brief overview of the mural-making process before being invited to begin the FIGMAGO adventure. Figmago is made up of eight different rooms and passageways full of art and installations. In Figmago Alive, performers, as pictured here, bring each setting to life. After walking through a closet of hanging costumes acting as a curtain, guests were led to a room where a long communal table awaited, with blank pages of paper placed at each seat. The audience was instructed to draw. Meanwhile, a woman carrying a long feather glided around the dimly lit room on a hoverboard. Dramatic piano music played in the background, and a silhouette of a dancer was projected onto one of the walls. The setting was so engrossing that it came as a great surprise when two performers suddenly jumped atop the table and kicked every last unfinished drawing to the ground. "In the creative process, you throw out a lot of ideas as you go along — we wanted to bring this part to life," Sanders explains. The performers then proceeded to dance on the table, legs flailing just inches from the audiences' faces. Then a narrator guided the way to the next section, where 10,000 pounds of sand covered the floor, for an exploration of color. "Each room is designed to trigger the creative spirit within the viewer," Saligman says. In what’s deemed the ribbon room, a dancer gracefully moves atop a platform, being careful to never touch the ribbon spinning from the ceiling fan overhead. The performance included several more dance pieces, taking place in a succession of rooms where every inch of space — from the walls to the ceilings to the floors — was decorated in one way or another. At one point, two dancers climbed up one of the walls to physically paint themselves into the artwork. In another room, adorned with a white canoe and an illuminated globe, a dancer emerged from an aerial contraption shaped like a cocoon. Another dancer joined in, and they put on a spinning performance above the ground in the center of the crowd. The cocoon imagery is tied to the name. FIGMAGO is a made-up word combining the figment of your imagination and the end stage of a butterfly "when it takes flight," Sanders explains. The term for that final, fully developed insect stage is imago. Nearly 15 visual artists worked to create the multi-room setting of FIGMAGO, and five performers from Sanders' JUNK troupe are involved with the live component. An array of other crew members from both studios also pitched in to help with the lighting and set design. "We had never collaborated with dancers and actors before, which was a ton of fun," says Saligman. "They are a different kind of artists with different perspectives of the world, and so we were able to exchange all of these ideas together that really helped to bring the meaning of art to life." The ticket price for FIGMAGO Alive is $38. The version without the live component costs $24. With that option, the experience includes a narrator who guides the way through the rooms and installations, but no actors or dancers. FIGMAGO Alive shows are offered Fridays, Saturdays, and Sundays. Tickets for the static version are available Wednesdays through Sundays. "It's like the difference between doing a guided tour of a museum and finding the way on your own," says Sanders. "We call our actors the spirit guides, your aesthetic gurus." Saligman says she hopes to turn the FIGMAGO experience into something permanent within the next few years. "This is just a prototype," she says. "The plan is to spin it into something long-term — something that lays somewhere in between an immersive gallery and a museum."